Sporting Chance are able to offer physical activity / education training for teachers, teaching assistants, and lunch break supervisors. We can help provide teaching staff with the skills and confidence to improve their planning, teaching, and assessment of their own PE lessons or simply offer ideas on how to take their PE lessons to the next level. These training sessions can be delivered as part of the school day e.g lunchtimes, or as part of a staff meeting or INSET day. If this is something that your school could benefit from then please get in touch. Children in the UK spend an average of 25% of their school day on the playground. Many lunch time supervisors feel ill-equipped to provide suitable lunch time activities that could be helping to deal with challenging behaviours. We can offer a solution that would provide these staff members with the skills and confidence to lead engaging activities. This will help to build rapport between the staff and children, and lead to a improved lunch time experience for both pupils and the staff. 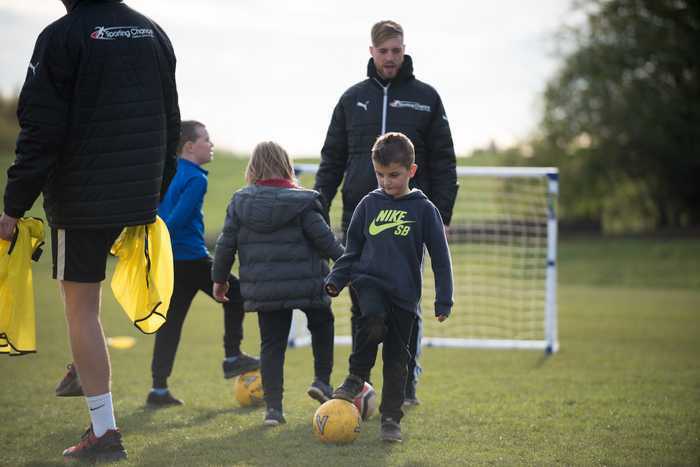 At Sporting Chance we can offer a variety of solutions to support your teaching staff in the delivery of physical activity / education, all of which can be tailored to suit your schools’ individual needs. If you want to improve the quality of your school’s PE lessons and invest your Primary PE and School Sport Premium in a cost effective and sustainable manner, then there are a number of programmes available.